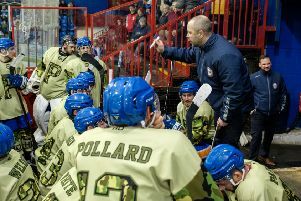 Coach Slava Koulikov has warned his table-topping Phantoms not to allow complacency to creep in. The city side have made a terrific start to their debut NIHL Division One South season - reeling off nine successive victories to roar to the summit. They face back-to-back league encounters this weekend as London Raiders visit Planet Ice on Saturday (7pm) before Koulikov’s men head to Swindon on Sunday (6.15pm) - and a pair of tough tests look assured. London have twice pushed second-placed Bracknell hard in the last two weekends. They were pipped 6-5 by the Bees on home ice and then went down 4-2 in Berkshire. Meanwhile Swindon will be looking for revenge after an overtime defeat in Bretton 11 days ago. They also suffered an unwanted first last weekend when losing 5-1 at Streatham. It was the first occasion in which a former English Premier League side (Phantoms, Bracknell and Basingstoke are the others) have lost to a team who were already operating in the NIHL ahead of this season. “We have completed a quarter of the season and we are definitely where we want to be in terms of results,” said Koulikov. “But certain patterns are emerging and there are still things we need to correct. “I’ll be speaking to the players again this week. Complacency and motivation are two words I will mention. “We can’t afford to get into a position where we are just going through the motions. “Former EPL teams are now being pushed harder than they were earlier in the season and I’m definitely not surprised by that. “There have been some really close games lately with the top four being run close by NIHL sides and then we saw Swindon lost at Streatham last weekend. “There were warning signs that a result like that was coming. We have been behind ourselves against Invicta and MK Thunder. “The teams who were in the NIHL will take confidence from Streatham’s win against Swindon. Ourselves and the other old EPL teams need to be aware of what can happen if we’re not at our best. Defenceman Greg Pick remains a doubt for Phantoms after missing the last three games with a groin problem.